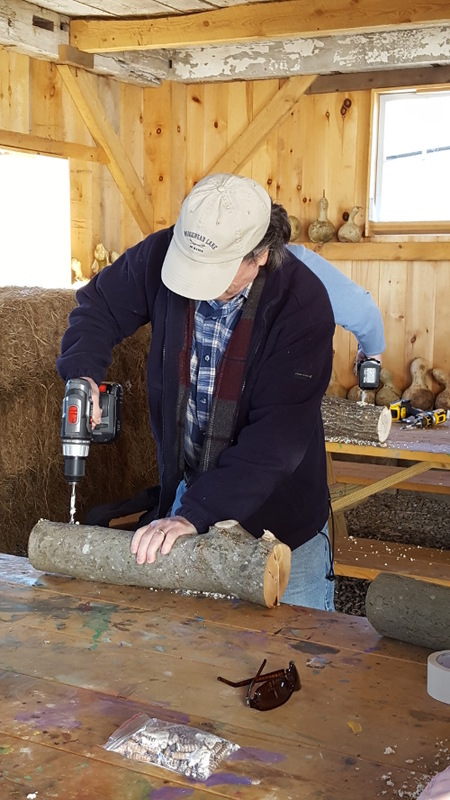 Sue and I attended a hands on Agricultural Clinic At Prescott Farm in Laconia, NH Saturday 04/21/18. 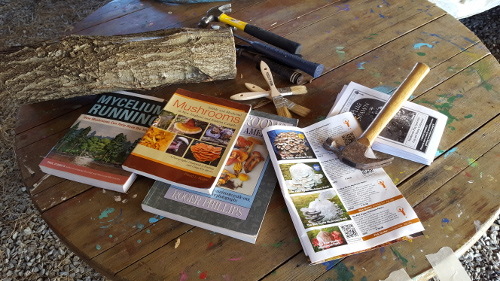 She has been interested in growing her own mushrooms for years, and, when she saw this event advertised, she signed us up immediately. 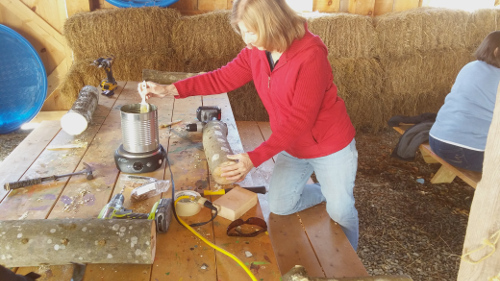 Sue sealing the spore plugs with melted beeswax. We headed out just after 9:00 am as the clinic began at 10:00 am. It's a beautiful ride up Route 11 along the western shores of Lake Winnipesaukee. Even though the temperature was climbing into what would be the upper 40s, because of the past cold you could see that the whole northern part of the lake was still covered with ice. It won't be long, though, before that's all gone! 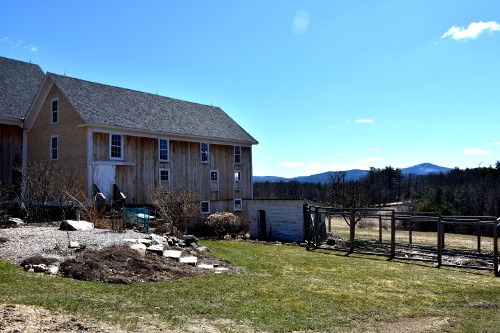 Prescott Farm sits on the side of a gently rolling hillside with distant views of Lake Winnipesaukee and the surrounding mountains. 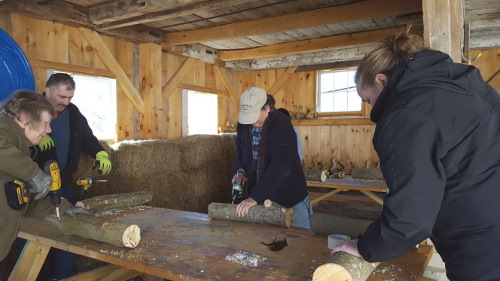 The clinic was held in their barn, which was in the process of a major renovation. The clinic leader, Sarah, was really wonderful in explaining to the 10 of us, gathered on benches in what used to be the farm's pigsty, the history of the farm, and of the importance of mushrooms in the overall forest ecosystem. I had no idea the vital role the mycelium of the mushroom plays in managing the ecology, and am interested enough to want to learn a bit more. 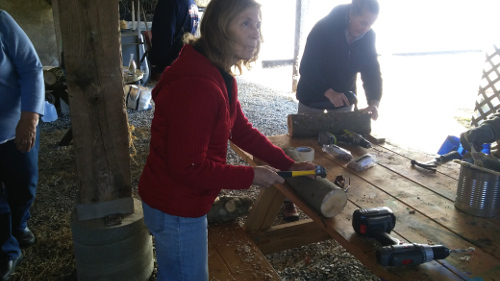 After about 40 minutes of introductory lecture, we all gathered around benches, each with a freshly cut 2 foot log that would be the base for our "mushroom garden". We took a 5/16 inch drill bit and bored holes that were spaced about 4 inches apart from each other into the log. Then, we used a small hammer to pound pellets of blue oyster mushroom spores into the holes. They had Shiitake spores as well, but Sue had already ordered packets of them for logs her brother and uncle had dropped off for us. 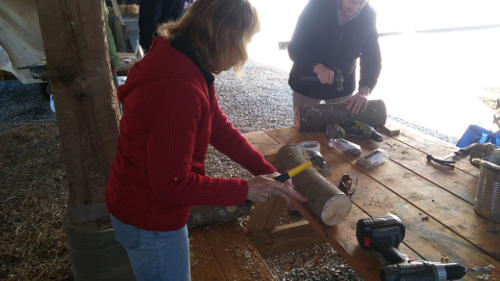 The final step was to then seal each pellet area, the ends of the log, and any other exposed wood with melted beeswax. That's used to keep out any other type of spore that could compromise the growth of the type of mushroom spores we wanted. After the clinic, we wandered around the grounds of the farm for a few minutes before heading over to Route 3 to grab a bite to eat and get some coffee. Coming out of Laconia, we took an offshoot up Route 11 B and then onto 11 A so we'd come out by the Gunstock Ski Area in Gilford. I thought it would be fun to drive up to the lodge, and see the area in the spring. There was still a lot of snow on the trails, but the runoff from it coming out of the drainage pipes showed a rapid melting going on. I suspect you could still ski the mountain, but not sure if any lifts would be running. Before heading home, we stopped off at Prospect Mountain High School in Alton to check out the local rotary group's annual home and garden show. There were a lot of interesting exhibits, and Sue and I met some wonderful folks that we hope to stay in touch with. 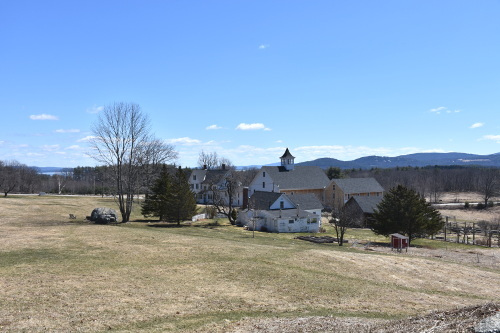 View of Prescott Farm from the visitor center parking lot on the hill above the farm. Renovations in progress to the barn coming along. Reference guides and information of interest. 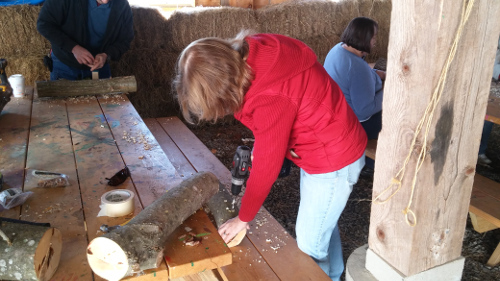 Everyone got busy drilling spore plug holes into their logs. Drilling spore plug holes into my log. 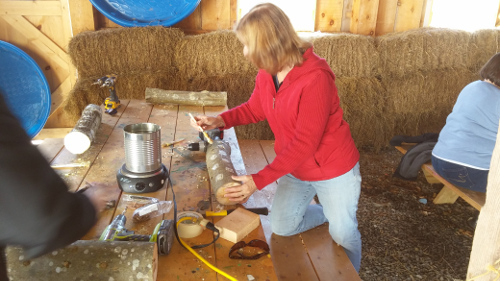 Sue drilling spore plug holes in the log. 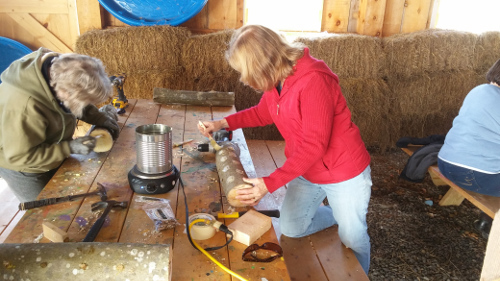 Sue tapping spore plugs into the drilled holes.